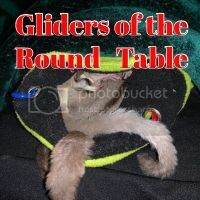 Register Log In GliderCENTRAL Forums Breeding & Babies Joeys and parents long term? My gliders have had their second set of joeys with me (2 before i adopted them). The first set i found an amazing home, this second set I've yet to find any good homes (still looking, I am incredibly picky). My question is how will the joeys and the parents fair long term with each other? I've read that they should be re-homed/removed cause that is what is natural for them in the wild. I can't seem to find any good information on this and what are others experiences if they've gone this route. I just had my male (the dad) neutered, and would obviously neuter the little boy joey to avoid any more joeys. Joeys were fun and an amazing experience, but finding the right homes is just too hard and stressful (i am not in this for money either). If you have the little male joey neutered you would have a wonderful colony. Colonies are fun to watch and then they will have the perfect home with you. Feather is right. Once the little male is neutered, families are so very loving and bonded. IMO, they are truly very special. I think they share something extra an unrelated colony does not.